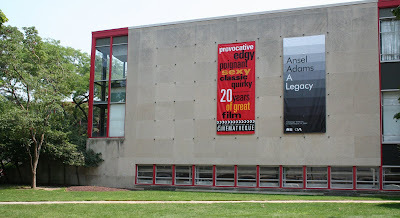 last week I had finally made it to the cleveland institute of art to see the ansel adams exhibition - whew, even though it's been in town since may, to think I almost missed it (saturday was it's last day). I have always found a deep sense of the sacred in adams photographs of the natural world. who is not familiar with his iconic image of moon and half dome in yosemite and his images/landscapes of other wondrous places in the american west. however, before taking in this exhibition I never realized that adams was also a master with respect to portraiture. in 1980 jimmy carter awarded adams with the presidential medal of freedom for "his efforts to preserve this country's wild and scenic areas, both on film and on earth." unfortunately our wild and scenic areas are continuing to be threated, in fact because of greed, the quest for fossil fuels, and global climate change, these places are at more at risk than they were back in 1980. I pray our wild and scenic places do not go the way of so many animal species - magnificent creatures now found only within the confines of zoos or preserves. will our wild places be found only in images hung of gallery walls? glad you got to see it before it left! i bet it was phenomenal! kinda like brady quinn?